On November 1st an exhibit of plein air paintings by the Washington Society of Landscape Painters opened at the Athenaeum on Prince Street in Old Town Alexandria, VA. Athenaeum curator, Twig Murray's concept for the exhibit was for "sketchy" field studies that might be used to inspire larger, more complex studio paintings or be the finished work in itself. She wanted to show the various methods artists use to create their finished paintings. 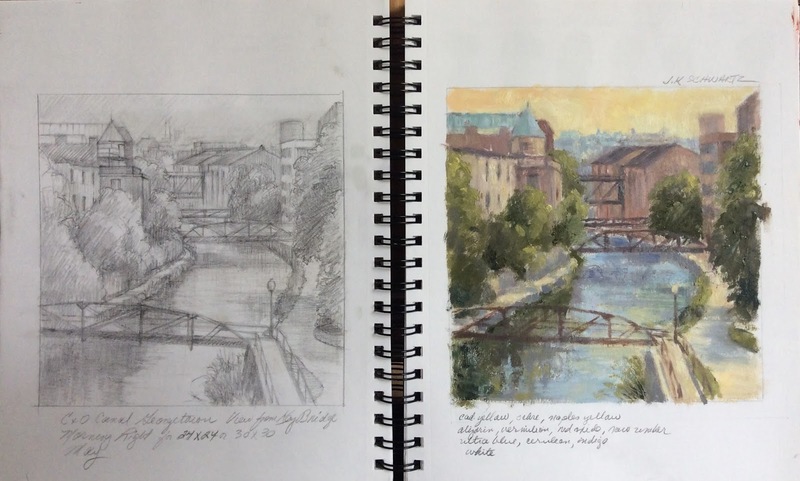 The WSLP is well known for plein air painting and it is something the group does together the last Sunday of every month. 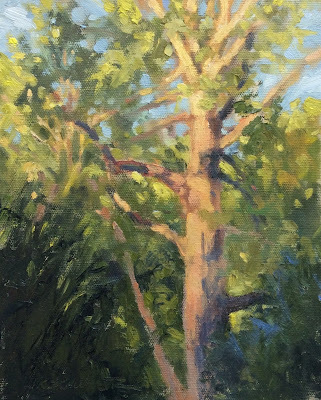 Some members paint exclusively en plein air while others view their paintings as studies. I fall into the latter group. That is not to say that on occasion I feel that a particular painting created on site is "done" and I frame it up and exhibit it along with my studio work. The three little paintings shown here were all created from my deck in the summer between the hours of 6:30 and 8:00 PM on different evenings. 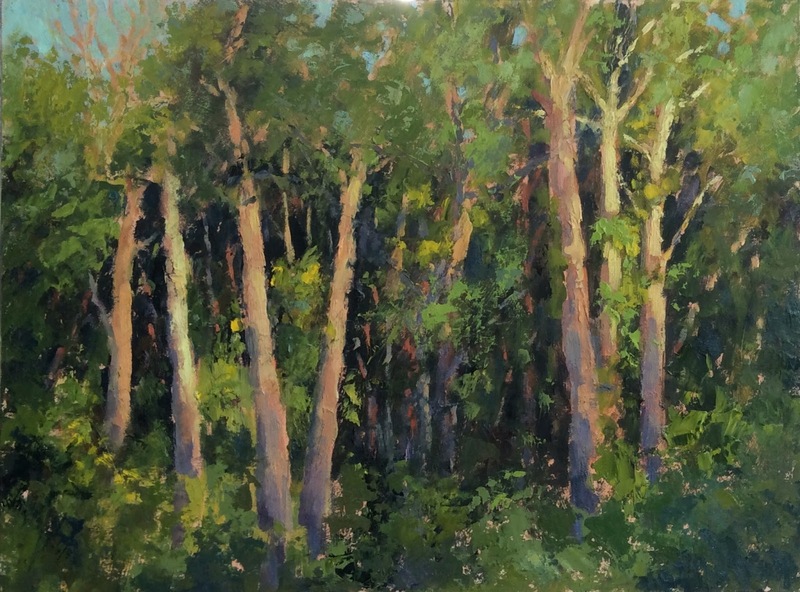 Each portrays a different view of the woods behind my house being drenched in the same golden light. While they do stand on their own I was most interested in studying the light and interesting ways to create texture and movement when painting the trees. They are studies in positive and negative spaces and the use of both palette knife and brush. They will be helpful references. Also included in the exhibit is a glass case holding sketchbooks by four members and mine is one of them. Shown here is how I prepare for a studio painting by doing a pencil sketch on one side and then a color study on the other. I can then prop the sketchbook up and use these studies as my reference. I find it more helpful and interesting than working from a photo as I have already edited the information before me. There is one more week to view the exhibit: THE ARTIST'S PROCESS at THE ATHENAEUM GALLERY 201 Prince Street, Alexandria VA. Closing date is Sunday, January 7th at 3:00 PM.